Jon Stewart is leaving Comedy Central's The Daily Show. It's a little hard to fathom, frankly. Stewart is as familiar among young consumers of news as any of the broadcast anchors—probably more so in many cases—and his brand of media criticism has changed the face of the journalism industry over the course of the last 17 years. And now he's going away. The loss is a blow to Comedy Central and parent company Viacom where the matter of Stewart's successor will undoubtedly be a high priority in coming months. Stewart made the emotional announcement at the end of tonight's show, saying he will leave sometime this year—"I'm up in September, might be around then, might be December, might be July"—and has no specific plans for his next step. "I'm not going anywhere tomorrow, but this show doesn't deserve an even slightly restless host and neither do you," he told viewers. "In my heart, I know it is time for someone else to have that opportunity." He added that hosting the show has been the honor of his professional life and he would miss filming it every day: "Seventeen years is the longest I have ever in my life held a job—by 16 years and five months." Stewart has gone from self-deprecating gadfly to journalistic referee since he took Craig Kilborn's place on the then-embattled nightly series in 1996. Under the George W. Bush administration, The Daily Show became one of the loudest voices of dissent as the country entered two different wars. Stewart became infamous both for his vocal criticism of the political establishment and for his merciless attacks on bad journalism—his appearance on CNN's arguing-head show Crossfire helped lead to that show's cancelation. The Daily Show, said a source at Viacom, will continue after Stewart leaves. It's difficult to imagine what it might be like without him. One thing that tends to get lost in the discussion of Stewart's political and critical acumen is the level of talent he attracted and nurtured at the show. He helped to launch or boost the careers of more than half a dozen high-profile comedians who are now ubiquitous in TV and movies. Steve Carrell, Rob Corddry, Ed Helms and John Hodgman all appeared frequently on the show in various capacities. Three more of Stewart's colleagues moved on to start news shows of their own—Stephen Colbert, the former Colbert Report star set to take David Letterman's spot on CBS' The Late Show on Sept. 8; Larry Wilmore, who now follows Stewart with The Nightly Show; and John Oliver, whose weekly half-hour Last Week Tonight on HBO debuted to raves last season. Stewart may not have invented the comedy news format—he didn't even create The Daily Show—but he arguably perfected both. He's shown signs of discontent with his perch at Comedy Central in recent years, taking a lengthy leave of absence to shoot the politely (if unenthusiastically) received Rosewater, an indie movie about injustice in Iran, and peppering his monologues with references to the futility of political comedy. It's certainly sad for many fans to see him leaving, but it's not altogether surprising. The series is an odd fit with the rest of the network's slate—it ought to be, it's been around for the better part of two decades—but it's still incredibly valuable to the network, accounting for some $55.6 million in ad revenue in 2013, according to analyst sources. The show is reliably filled with integrations, frequently automotive and consumer-packaged goods. Comedy Central president Michele Ganeless sent a message to press after news spread following the show's taping. "For the better part of the last two decades, I have had the incredible honor and privilege of working with Jon Stewart," Ganeless wrote. "His comedic brilliance is second to none. Jon has been at the heart of Comedy Central, championing and nurturing the best talent in the industry, in front of and behind the camera. Through his unique voice and vision, The Daily Show has become a cultural touchstone for millions of fans and an unparalleled platform for political comedy that will endure for years to come. 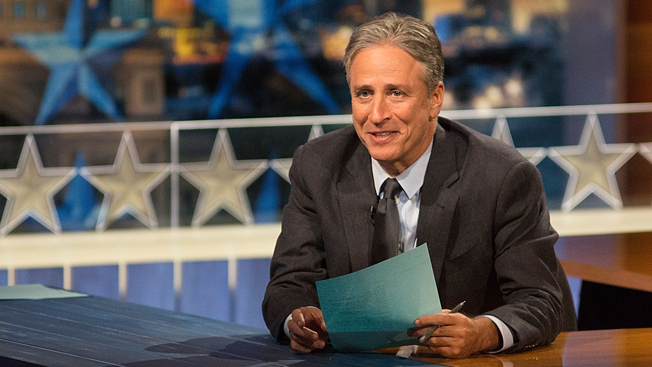 Jon will remain at the helm of The Daily Show until later this year. He is a comic genius, generous with his time and talent, and will always be a part of the Comedy Central family." Stewart returned the sentiment on the show Tuesday evening, tearing up in front of the cameras and the audience. "What is this fluid?" he asked himself, blinking back tears. "What are these feelings? Frankenstein angry!" The urge to depart, beyond that generalized restlessness mentioned above, is also personal, he said: "I'm gonna have dinner on a school night with my family, whom I have heard from multiple sources are lovely people." He closed the monlogue by thanking everyone who'd watched the show, irrespective of why. Then he cut to a black and white video of a monkey bathing a cat.